On tonight’s episode pissed off over Burrell’s blatant aggression towards vampires, Eric took matters into his own hands and kidnapped his daughter, Willa. Just as Eric was thinking about killing her she told him she could tell him about, “the experiments”, do tell…. After dangerously testing the limits of his powers, Bill enlisted a TruBlood innovator to synthesize a new type of blood – but had difficulty finding the right donor. Sookie learned why Warlow is after her, she has Royal blood. Sookie and Jason’s Grandfather, Niall Brigant went to the fairy hideout and found them all dead, they were killed by Warlow. Sam received unexpected help from Nicole and her Vampire Unity Society (V.U.S.) associates. Steve Newlin found his past ideals turning into a current nightmare. If you missed tonight’s episode you can read our full and detailed recap here. Official HBO synopsis of next week’s episode: Sookie (Anna Paquin) confronts her growing attraction to the mysterious Ben (Rob Kazinsky). Eric (Alexander Skarsgård) counters Burrell’s (Arliss Howard) brutal anti-vampire initiatives by hitting his nemesis where it hurts the most. Growing up all too quickly, Andy’s (Chris Bauer) faerie daughters end up keeping dangerous company. Sam (Sam Trammell) and Nicole (Jurnee Smollett-Bell) make a connection. 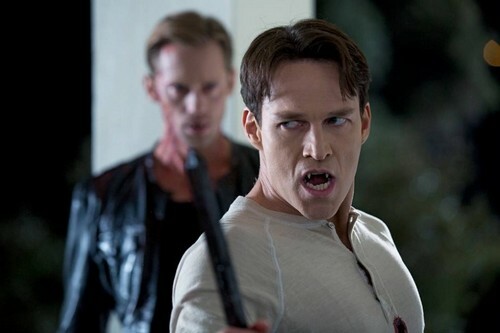 Bill (Stephen Moyer) tasks Takahashi (Keone Young) to synthesize a new kind of blood. On next week’s show the war between the humans and vampires will continue to escalate. It also looks like Sookie has had her fill of vampires and werewolves but of course she does not want a plain old human next, she has her eyes on Ben Flynn , a half faerie. She is so fascinated by him she invites him to dinner next week. She asks him, “What is it about me, that you want.” I wonder how Eric is going to feel about that? Bill told her in tonight’s episode she is dead to him, so I guess he won’t mind. Niall Brigant tells everyone that Sookie carries the Fae and it is her they have to protect. Warlow is after her and Ben is going to be helping him protect her. Eric counters Burrell’s brutal anti-vampire initiatives by hitting him where it hurts the most. So I am guessing that Eric who took Burrell’s daughter to Fangtasia still has her and is going to do something to her or at least threaten too. However, rumor has it Amelia Rose Blaire who plays Willa Burrell is only schedule to stay around 2 episodes, so next week may be her last. Andy’s four faerie daughters are really a handful and growing at a quick pace. Next week the girls will make some dangerous company, because the girls are not girls any more they are young women. Bill and Jessica have their eyes on them. Since Sookie turned him down to help with the synthetic blood, he has his eyes on Andy’s girls. True Blood episode 4, “At Last” airs on HBO on July 7th, 2012. Check out the preview video below of episode 4 above and let us know in the comments below what you think! Are you enjoying season 6 of True Blood?